Inland Erosion Control approaches erosion control projects with an onsite evaluation, and a consultation with you to review your erosion and sediment control plans and ensure the use of BMPs in economical ways. 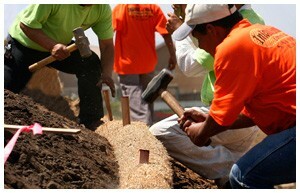 Then, we provide, install, maintain, and remediate all structural and vegetative BMPs. Lastly, we conduct site inspections to review BMP performance, and ensure that all erosion control work is in full compliance with federal, state, and local laws. This is a very economical method of spraying a wetted mixture of groundcover seeds, mulch, fertilizer, and tackifier on bare hillsides and slopes to hold it in place until the ground cover germinates and matures. IEC maintains a fleet of Finn hydroseeders for installation of seeds, BFM (Bonded Fiber Matrix), wood fiber, mulch, and SFM (Stabilized Fiber Matrix) products from all leading manufacturers. Straw blankets provide temporary ground cover in channels and on slopes while the permanent vegetation germinates and matures. 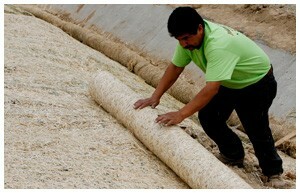 They also provide seed protection, moisture retention, slope protection, and water velocity reduction. These blankets come in different grades to accommodate various lengths, pitches, and water velocities. IEC can help you select the best blanket for your needs. Straw wattles are used as sediment barriers designed to temporarily prevent sediment sheet flow from leaving a job site, and slow storm water runoff so sediment deposits at the wattles. IEC can provide and install straw wattles to effectively control your erosion challenges. 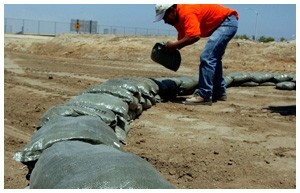 Properly filled and placed sandbags are often used to redirect storm and debris flow away from land improvements. Inland Erosion can help you with all aspects of this economical, temporary erosion control method. 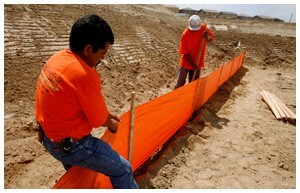 Silt fencing is one of the most common sediment barriers. It comes in various grades that are designed for different areas being protected, estimated flow rates, and the duration of your project. Wire reinforcement and steel posts can be used in critical areas. Inland Erosion can help you select the best silt fencing for your project. IEC provides all materials and labor needed to implement an effective SWPPP following best management practices (BMPs) for residential or commercial construction sites from vegetative solutions to poly rock gravel bags, straw wattles, straw blankets, silt fences, and construction entrances. Inland Erosion delivers an ideal solution for developers and contractors looking for a cost effective and fully compliant method of dealing with onsite concrete washout. For more details about the IEC concrete washout system, click here. 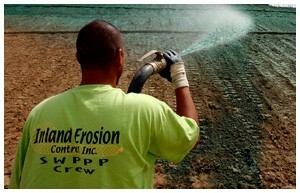 Inland Erosion provides street sweeping services for developers on daily, weekly, and monthly maintenance programs. We also specialize in sweeping services for dirt hauling operations. IEC has a fleet of water trucks driven by professionals who specialize in helping developers comply with dust control requirements. Our water truck services meet or exceed state air quality control standards. Inland Erosion provides 40-yard and 10-yard roll off container services to developers and homeowners for trash collection and removal. IEC provides residential developers 3-yard tilt hopper trash containers with secured lids to help eliminate and reduce trash pollution from job sites, helping to satisfy an erosion control maintenance issue. IEC maintains a full staff of more than 15 maintenance crews to help sustain and maintain continual cleanup of construction sites for developers on an ongoing basis to help reduce storm water quality infractions. If youd like to learn more about the best erosion control or site maintenance solution for your project, contact an IEC specialist.